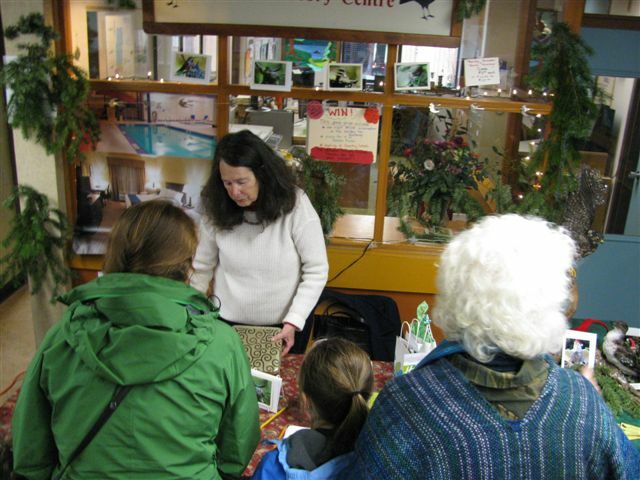 Natural History Steward Tina Wai Tabling at the Hornby Island Christmas Fair. We had a wonderful time tabling in the entrance of the school during this year’s Christmas Fair. Congratulations to Christine Tamburri from Hornby Island, the winner of our 2015 getaway package draw! Our birds in holiday hats taken by Barb Biagi at the Natural History Centre and Hornby Island hummingbird cards by Barb Biagi and Sam Elder were also highly popular. We were delighted to see so many locals–many who had never seen the exhibit before–come through the Centre during the Fair. Thanks to everyone who stopped by and supported Natural History. Seasons greetings to all!